Jacobson asked the question Hamilton had to know was coming. 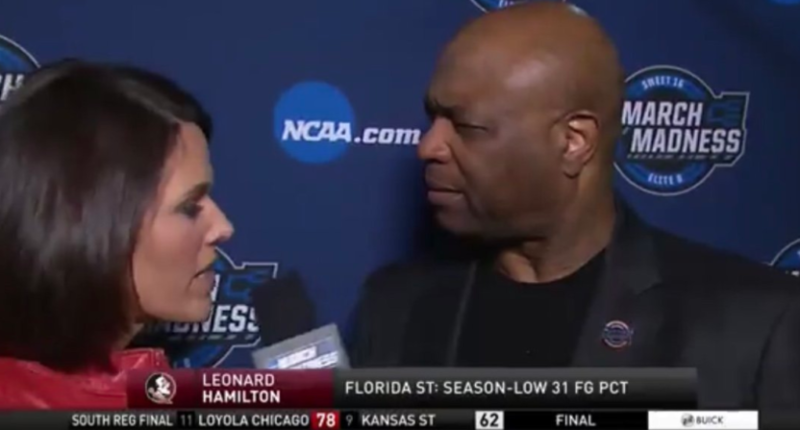 Sure, Leonard Hamilton was probably disappointed and upset. His Florida State basketball team just took a tough NCAA Tournament loss to Michigan, four points away from an improbable trip to the Final Four. Maybe as sports fans and media, we don’t give enough credit to the coaches who are asked to talk about a loss in its immediate aftermath. But that’s also part of the job. A coach is expected to represent his team, his university. He’s expected to answer questions from the press afterwards, and perhaps give his players time to deal with losing. Hamilton has also been a major college head coach for 30 years, and coached one season in the NBA. He had to know what the first postgame question would be. Why didn’t you guys foul? Down by four points with 20.9 seconds left, Florida State took the ball up the court and right away, TBS analyst Dan Bonner says “Take the ball to the basket.” It was conventional basketball wisdom. Score a quick basket, cut the lead to two and foul Michigan as soon as they inbound the ball. Instead, Seminoles shooting guard PJ Savoy got the ball off a screen and took a three-pointer with two Michigan defenders in his face. But even when the shot missed and the Wolverines’ Duncan Robinson got the rebound, there were 11 seconds left on the clock. If Florida State fouls him right away, they still have a chance for a four- to five-point game and enough time to conceivably tie the game or maybe even win it. But FSU’s Terance Mann didn’t foul Robinson and let him run the clock out to clinch a Michigan victory. “Why didn’t you guys foul?” It was the first question Turner’s Dana Jacobson asked Hamilton when he was ready to talk. Again, Hamilton had to know it was coming. But instead, he decided to act like it was a dumb question. Jacobson explained what everyone watching the interview was thinking. Why not foul Robinson? There were 11 seconds left. The game didn’t have to be over. It was a completely valid question. Hamilton was right in saying that the Seminoles didn’t lose because Mann didn’t foul when he had the chance. Their inability to score, especially off Michigan turnovers, had more to do with why the Wolverines are going to San Antonio next weekend. But he had apparently decided the game was already finished. As The Spun points out, Hamilton began walking down the sideline toward Michigan coach John Beilein with eight seconds left. But was he telling Mann to foul in the three seconds before that? That, we don’t know. To his credit, Hamilton didn’t criticize his players. He didn’t single out Savoy for taking a contested three-pointer, rather than attack the basket. He didn’t single out Mann for not fouling when there was still a chance to tie the game. As Awful Announcing’s Phillip Bupp noted, Hamilton has been in similar situations and didn’t think the game was over. Coach Hamilton sure didn't think the game was over against Boston College this January. FSU fouled while down 6 w/ 18 secs left, and while down 6 w/ 7 secs left. So let’s be fair and presume that Hamilton was protecting his players. (Maybe someone will try to joke that Hamilton knew Jacobson is a Michigan alum.) But given the obvious situation and his past approach to similar circumstances, his response to Jacobson seems disingenuous. It’s also a really bad look to come off as a bully and get into Jacobson’s face for asking a legitimate question. Hamilton cooled down and eventually gave Michigan credit for playing good defense on his team. But his irritated demeanor, confrontational response and lack of professionalism at the beginning of the exchange is what people are going to remember. That’s not the kind of memory that Florida State’s impressive run to the Elite Eight as a No. 9 seed deserves to have associated with it.